First I didn’t notice it because the cover design looks like an old book. But I saw the book spine color began to fade away. So I googled about it and see people discuss about it on ATLUS forum. It seems that ATLUS will exchange the new book with the old washed-out one. But I thought that I won’t exchange it because I’m in Thailand. Send the book to them cost me a lot. Instead sending it, I put a plastic cover on the book for protecting further wash out. So game collectors don’t forget the put on a plastic cover on the book before using it. For people haven’t bought Demon’s Souls yet. 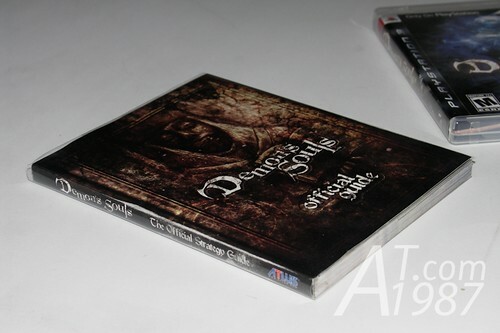 Play-Asia still has Deluxe Edition and normal edition with artbook and soundtrack CD. Grab it while you can. I got that book cover when I bought manga books at the book fair. It made from low quality plastic but I used it because it’s perfectly fit the book. I don’t have any links about the plastic book cover but in my country (Thailand) you can find the plastic book cover at stationary store and book store. Some store also do the custom fit cover for your books. If you can’t find it, maybe you can try using the plastic sheet and making the cover from it.